There are few more humbling, and frustrating, events in all of hunting than in missing a shot that you’ve waited months, if not years, to get. Be it a rut-crazed whitetail grunting his way across a prickly pear cactus-filled South Texas sendero, a bull elk bugling his lungs out on a Rocky Mountain hillside or a pronghorn antelope buck giving brief pause in his chase of a winsome doe around the dusty prairie, missing the shot of a lifetime can cause painful memories for years to come. This is because there are shots in a hunter’s life that come around so infrequently that they just can’t be missed. Veteran Outdoor Channel television hosts Pat and Nicole Reeve of Driven TV show fame know that truth full well thanks to a shot gone awry on a dream hunt a couple of years ago as the couple pursued a bighorn sheep ram in Alberta, Canada. Especially in light of the fact that the two Minnesota hunters were coming off a successful two-week-long adventure in the Yukon where the couple had successfully chased a variety of critters in front of the all-seeing television cameras. 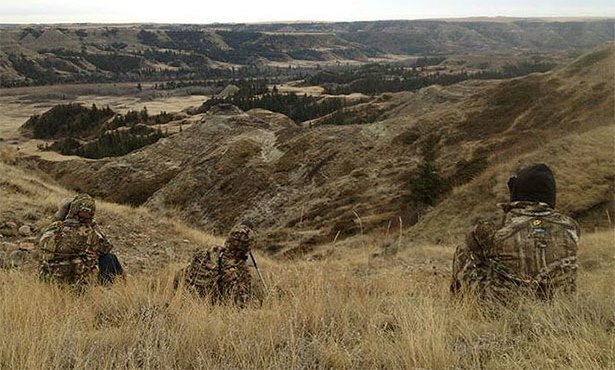 Hunting with outfitter Skip Selk of Selk’s Alberta Bighorns, Pat and Nicole were picked up in Calgary where a lengthy truck ride ensued to get the couple to the base of the rugged Canadian Rocky Mountains. From there, a bouncing trek on pack horses got them to a mountain basecamp on the perimeter of wild sheep country. Finally, another journey on pack horses got them into a remote spike camp where the hunt would begin in earnest. Playing a cat-and-mouse game with the changeable mountain weather for several days, Pat was finally rewarded with an opportunity for a long stalk and a chance to tag a mature bighorn ram. After a time-consuming climb to get into position, the sheep was in shooting range at just more than 500 yards, a lesser shot than the 600-yeard shot that Pat had made on the Yukon wolf a few days earlier. “I felt confident in making that shot, but it went right over his back,” lamented Pat. With his missed-shot opportunity at a trophy bighorn ram, which ran over the top of the mountain and disappeared, Pat and Nicole were left to wonder what had happened. According to Nicole, sheep hunting is a difficult enough endeavor to begin with, especially when lugging camera gear up and down rugged mountains with a rifle in tow. “Unfortunately, you’re not going to be successful all of the time when hunting – especially on hunts like that – and that’s just part of it,” she said. After the missed shot, Pat hunted hard for another day or so, hoping to get a chance at redemption. But as the hunt wound towards the finish line, the Minnesota hunter didn’t let his disappointment and sincere hopes for a trophy bighorn ram deter him from making another important, once-in-a-lifetime kind of shot, even if it was back home in Minnesota and far from the rugged Alberta mountains where the full-curled bighorn sheep of Pat Reeve’s dreams lived. With an important date waiting in the Lower 48, Pat made the decision to inform the outfitter that he must cut his hunt short just a bit. Doing so was necessary so that he could get back home in time for a “Father/Daughter Harvest Dance” with his then eight-year-old daughter, Isabel. Take one look at the family photos of a smiling dad and his daughter and it’s obvious to see that while Pat might have missed the shot of a lifetime at a bighorn sheep, he hit the bull’s eye dead-center in terms of what really matters in a man’s life. “Pat told me the night of the dance when he was there with Isabel that there was nowhere else in the world that he would have been at that moment than right there with his daughter,” wrote Nicole in the couple’s online hunting blog. As any good father can tell you, even one who is the co-host of one of the nation’s most popular television hunting shows, those are the shots that really matter in life and the ones that can’t be missed because they are truly once in a lifetime, even if no television camera is along to film.